Wednesday November 21st 1894 I was busy all morning with my work. after an early dinner I went down town to see Mary Woolf at the church and got her remedy for the chicken. I got things to make mince meat. I saw Hattie on the street and she says Fanny has had a dreadful time with having a tooth pulled. It was late when I got the evening work done. I made mittens for the boys to husk corn in. Thursday November 22nd 1894 I baked bread this morniong and cut the sausage meat. After an early dinner I went down town and over to see how Fanny is. I found her very miserable, I came home in time to do the evening work. There are four of my chickens sick. I am fixing medicine for the other ones. The weather is more pleasant again. 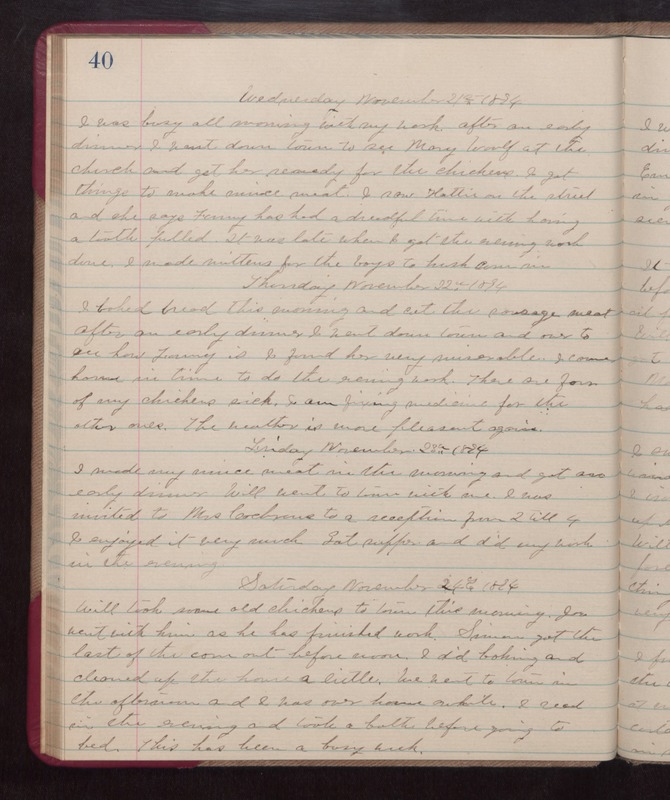 Friday November 23rd 1894 I made my mince meat in the morning and got an early dinner. Will went to town with me. I was invited to Mrs Cochrans to a reception from 2 till 4 I enjoyed it very much. Got supper and did my work in the evening. Saturday November 24th 1894 Will took some old chickens to town this morning. Joe went with him as he has finished work. Simon got the last of the corn out before noon. I did baking and cleaned up the house a little. We went to town in the afternoon and I was over home awhile. I read in the evening and took a bath before going to bed. This has been a busy week.